from our largest Butterfly Bush! I couldn't believe the luck in catching it on the camera! and one of the trees has a hummingbird nest! We just love all the nature doing so has brought to our home! This lil guy was really going to town on those fragrant blossoms! and allowed me to photograph it, too! Imagine having the camera there to capture this elusive beauty! - let alone twice in one week! I honestly couldn't believe my luck. Make your own - it is so easy - right from your kitchen's pantry- two simple ingredients is all it takes! Combine one part white sugar and four parts water. Heat the solution for 1-2 minutes to help the sugar dissolve and slow fermentation. If your tap water contains heavy chemicals, consider using bottled or purified water for purer nectar. You can also boil the water before adding the sugar to help purify it. 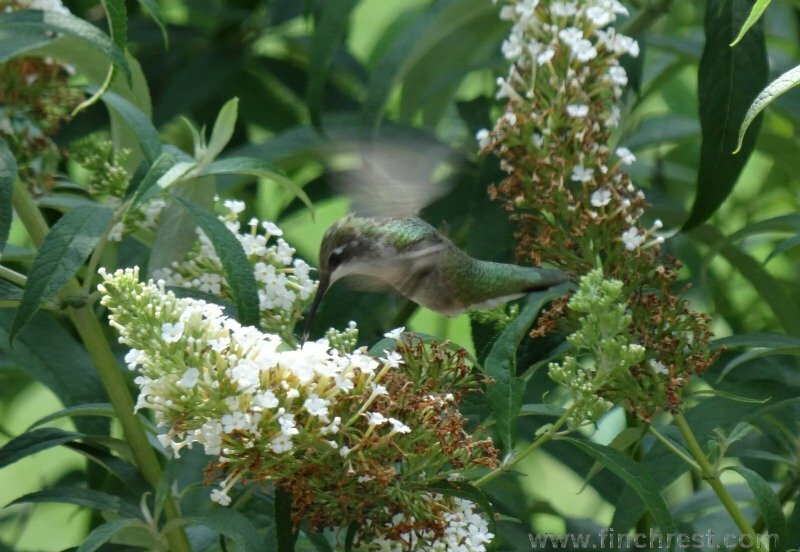 Do not use honey, brown sugar, molasses or artificial sugar substitutes for any hummingbird nectar recipe. Honey and molasses (brown sugar contains molasses products) are too heavy for hummingbirds to digest efficiently and can ferment more quickly, creating a mold that is fatal to hummingbirds. 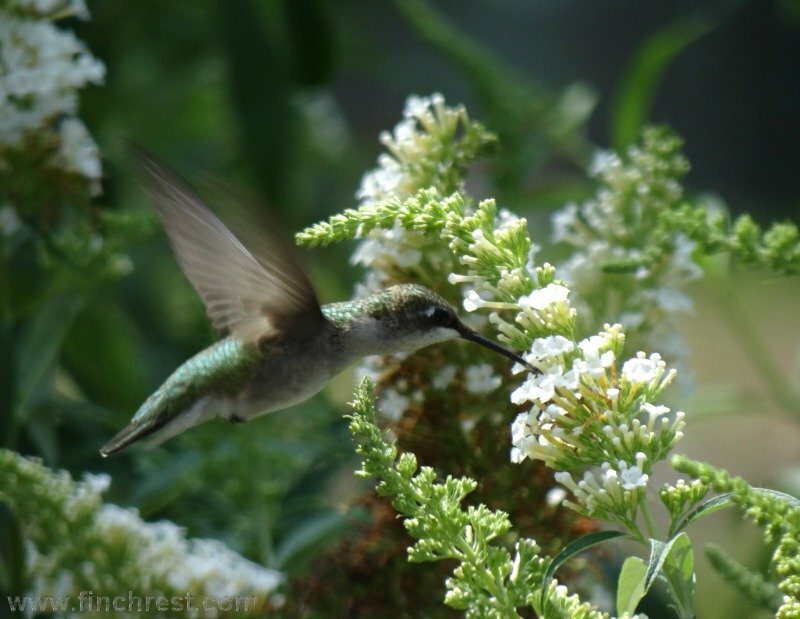 Sugar substitutes do not have the caloric energy that hummingbirds need for energy. While boiling will help slow the fermentation of the nectar initially, the nectar in hummingbird feeders is contaminated as soon as it is sipped by a bird. Therefore, it is not necessary to boil the nectar once the sugar has been dissolved. If you use extra fine sugar no boiling may be needed. 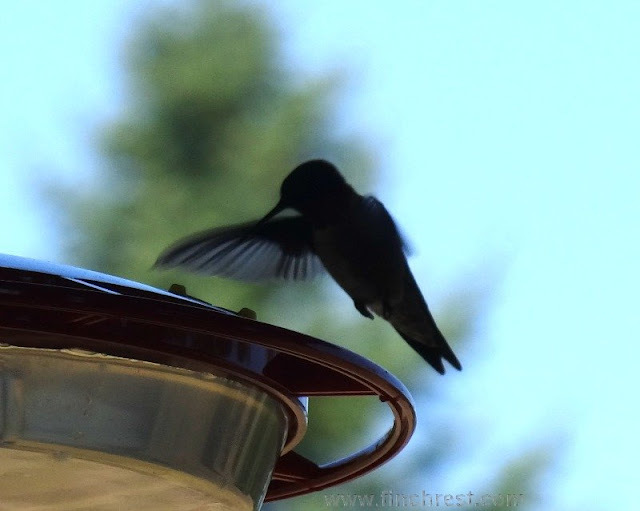 Hummingbird nectar must be completely cool before filling feeders. Hot nectar can warp or crack both glass and plastic hummingbird feeders and warm nectar will ferment more quickly. Commercial hummingbird nectar products may advertise different flavors, vitamins and other additives that are supposed to attract additional birds. These additives are not necessary for hummingbirds’ health and a simple sugar solution will attract just as many birds as more expensive commercial products. Unused hummingbird nectar can be stored in the refrigerator for up to one week. When making your own nectar, adjust the recipe quantity to only make enough for one week to eliminate waste. 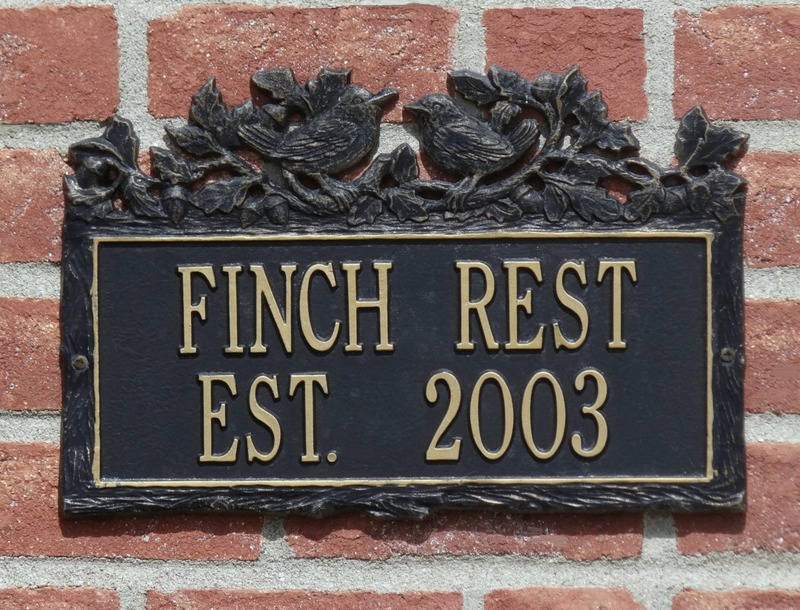 REMEMBER TO ALWAYS CLEAN YOUR FEEDERS AT LEAST ONCE A WEEK AND MORE OFTEN IF IT HAS BEEN IN HIGHER TEMPERATURES. I hope your surgery went smoothly. I love that you've planted so many trees. My husbands grandma once told me... 20+ years ago, that you can never plant too many trees. I've found she was so right! I agree.. it is so much better for them to make home-made nectar for the feeders. Those are outstanding pictures of the hummingbirds. I can hardly ever see them, much less photograph them. How crazy that you posted this and not 15 minutes ago I was looking outside the sunroom window and saw a hummingbird feeding from the flowering part of my coleus plant on our table, Michele! I was stunned. I've only seen one up close once before. I usually cut those flower stalks off the coleus, but now I'm thinking maybe I should leave it! Those really are beautiful shots. I wish I wasn't scared to death of hummingbirds. I need to get over that. Not ready for nectar yet, but I love your pictures. 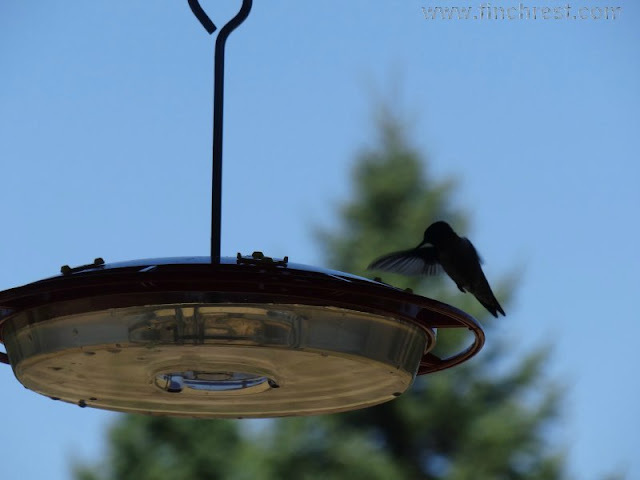 Excellent captured shots of the hummingbird; I've always used the 4:1 ratio too - and never red food colouring. The poem is a nice touch to this post. What great photos - I was in the yard and heard a sort of clicking noise - but me and my camera didn't work fast enough. Right as it gets dark- I have seen a hummingbird moth this year....it looks similar with the long beak but it is a moth. It is smaller and goes really fast. We have hummingbird moths, too - hubs seems to see them a lot and last year took a pick of one, but I haven't been able to find it in the files.if I do I will share b/c they truly are weird and remarkable! Oh my goodness! What fantastic photos! I really hope you are feeling well, Michele. You're a great photographer! That first pic is really beautiful! We don't have any hummingbird feeders here, but I'm interested in getting one someday. 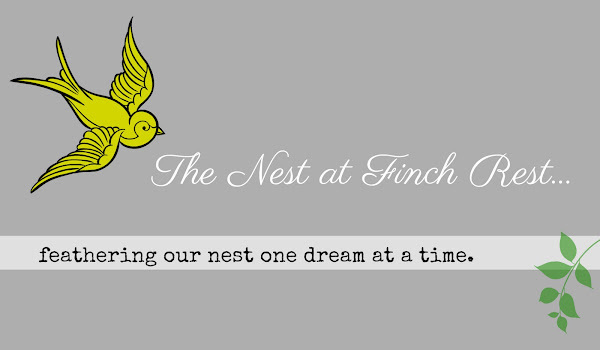 Thanks so much for visiting my blog and becoming a follower. I am happily following you too! I am swooning! 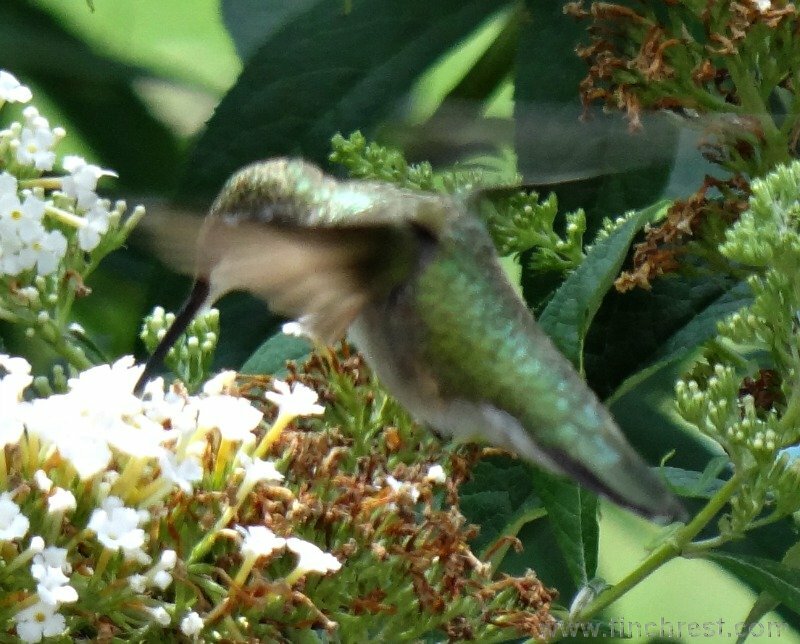 Those were awesome photos of the hummingbirds that visit your landscape. 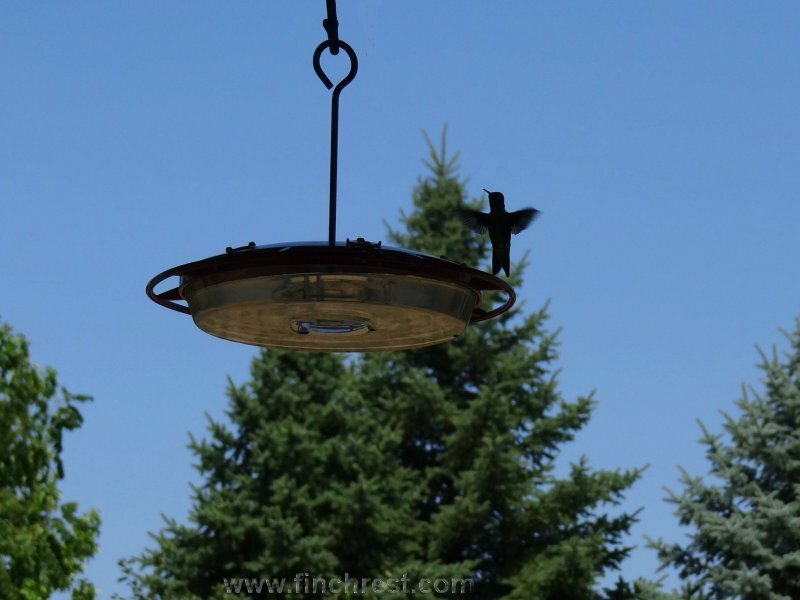 I try to attract nature as well with fruit trees, bird feeders and bird houses. It brings some interesting varieties to enjoy the landscape. P.S. I am your new follower. Michele, What beautiful pictures of this flittery little bird! Thanks for the recipe for the nectar and the great tips! I just prayed for you and will continue to do so. Please keep us updated on how you are! 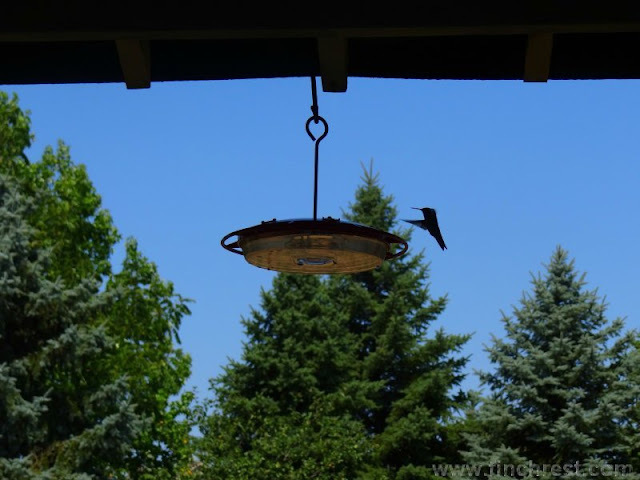 Thank you for the helpful tips on hummingbird feeders. I've heard also that if you start to feed, you need to keep doing it because they begin to depend upon you as a food source. Sending healing wishes your way. I love the clean look of your blog! It always such a nice place to visit. Thanks for the humming bird info. I have them around my house, but have NEVER been able to get them to come to a feeder. I've tried all kinds of feeders too. I especially love the first shot! How all went well with you on Thursday. Enjoy these sunny days of summer. How lucky you were to have yor camera, I never seem to have mine with me when they come to visit us! Hope you're doing good after your surgery. I love watching the hummingbirds and I can't get over the perfect picture you got. I love have all the trees...until the leaves fall. You are so lucky, we didn't get our feeder out in time, so we have only seen one. Your photos are great! Found you at Open House at Bernideen's Tea Time. My sister uses the same style of feeders that you have. The little hummers loved them along with all her flowers. How nice you were able to get some photos of these elusive little fellows. Thanks for the advice on feeding them. One flew in my house one day and I picked him up off of my window ledge and carried him outside. I was so excited to hold one in my hand. You sure got some great photos! How is your weather? Are you having a drought too? I envy you having room to plant so many trees. Good for you! OMGoodness...you did get lucky with catching all these great pics...thanks for sharing them. Wow, did you ever get some great shots. Thanks for sharing this images. Hummingbirds are so interesting! I love your hummingbird photos!!! They are gorgeous and how blessed you are to have such fine feathered friends living in your yard. I've never been able to draw them to feeders, but then I never have been very diligent to keep them cleaned and filled. I occassionally see them out in the back garden at the red bee balm and they are probably around more than I think, but with working all day, I'm sure I miss their visits.